These toilet paper holders are available for sale on Etsy from SOLIDink3d. 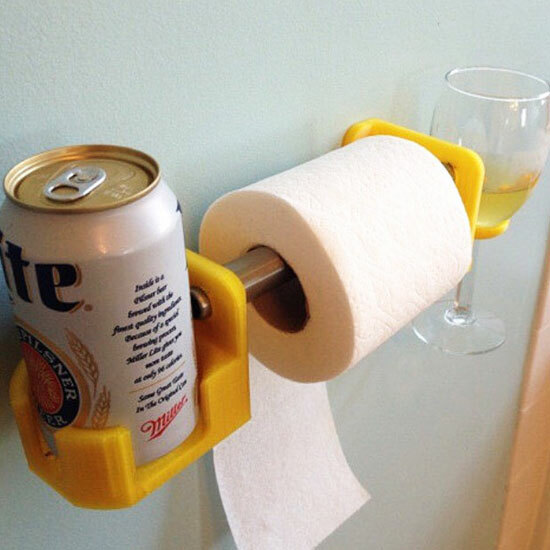 So yes, while you're shopping for his and hers Valentine's Day mugs and the perfectly rustic toile table cloth, you can also be buying an invention that lets you have beer while you're taking a dump. Toilets aren't the only place you can drink easier from thanks to this Etsy shop. You can also buy suction cup wine glass or beer can holders for the shower and bath, a double cup holder attached to a stake for beach and picnic drinking, and even a little beer-holding canister to attach to your lawnmower. In fact, if Etsy-crass is your aesthetic, Adam of SOLIDink3d has you covered in all kinds of ways. He also sells Kama Sutra branding irons and "game over" bride and groom branding irons. It's especially funny because his wife runs PurpleFinchCreations, sells just the kind of adorable handmade stationary we've come to expect from Etsy. But that's the great thing about the Internet: Charming stationary and toilet can exist side-by-side. Hopefully they never meet in real life though.